Ferns with red ribbons decorate the patio door frame, the chalk board for greetings and the patio post. Christmas wreathes hang from the window with, like the fern that decorate the patio door, have red ribbons on them. Beside the bench are two Christmas gift decorations. On the bench itself, a draped a red plaid blanket, rested a small Christmas gift in red wrapping paper and pillow with Christmas themed cases. A simple space with a coffee colored wall where, from white and red colored yarns, hangs the word 'joy' from a white frame. Under that is a rustic bench draped with a red fur sheet and on that are placed pillow with Christmas themed cases. Beside the bench are two small Christmas trees with red and silver decor and between them, an aged red sled and lamp. On the other side of the bench are two small but dried Christmas trees to break the monotony of the color of the area. On the floor, in front of the bench is a red fur rug. 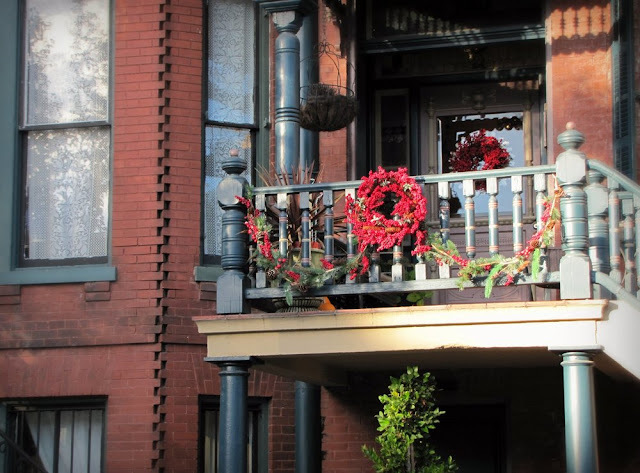 Christmas wreaths hang from the windows by red velvet ropes. Under those windows is a metal tea table and chair. On the table is red potted plant, small wood sled and a ceramic lamp serves as decorative table pieces. At the corner is a Christmas tree adorned with red and gold balls and ferns topped with a golden star. Under the tree are gifts wrapped red, green and gold wrapping with ribbons. A whitewash bench, two side tables and a rocking chair is in front of a whitewash window. The bench and the rocking chair is decorated with avocado green cushions, ferns with red balls at the back rests and under the bench. On the side tables, one before the bench and another before the rocking chair, are small, ornamental Christmas trees adorned with red balls. Next to the trees are arrangements of pinecones and red balls. Mounted on the avocado wall next to the rocking chair are fern and red balls arranged in woven baskets. On a stone patio rests a rustic but durable wood bench washed in black. Pillows with avocado green and red Christmas themed case rests on it. Beside that is an antique but repainted lamp with a considerably large candle inside that rests on a green cloth. A patio space occupied by a set of wood woven sofas decorated with coffee cream cushions. A mix of long and square pillows with red plaid and snow flake cushions rests on the sofas. On the single sofa, under the snow flake pillow, draped a checkered blanket. Under the furniture set is a coffee cream handmade carpet. Within the patio space rests a wood woven set of a single sofa, a rocking chair, a foot stool and a glass-topped coffee table just in front of an ornamental fireplace. On the sofa, rocking chair and foot stool are red cushions with square pillows of a red and white design on the cushions of the single sofa and rocking chair. A white pot of red flowers, books and an antique lamp with a candle inside is present atop the table. The fireplace, on the other hand, is decorated with a large wooden star, a Christmas fern and three antique metal lamps with candles. 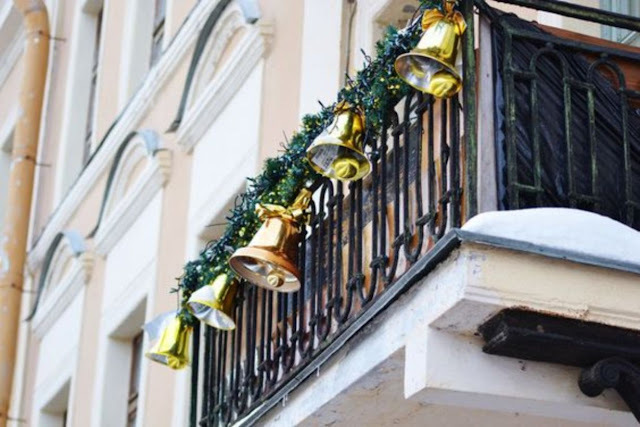 Each Christmas Balcony Decor Ideas is decorated with an antiquated metal lamps with red ribbons and a candle inside. Slightly off to the corner is a dark washed, wooden dining set of a table that can comfortably seat six, decorated with a red table runner, A Christmas fern and six white candle holders with candles. On the opposite corner, a bench with Christmas themed pillows and beside that was a wooden, antique corner table with a red lamp, a Christmas plate and fern on top of it. In front of the bench is a cushioned foot stool resting atop a handmade rug. Christmas wreaths hangs from the ceiling in between the Christmas Balcony Decor by gold ribbons. On the whitewashed dining table is a Christmas fern with silver and red balls. The pillows on the dining table chairs and the bench have Christmas themed cases. 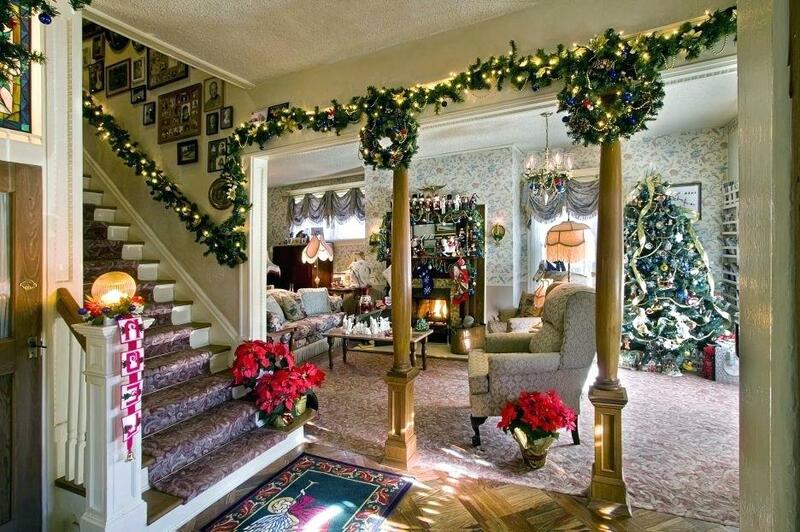 Little touches that transformed the space for the Holidays. A whitewashed patio space. From whitewashed furniture to the whitewashed walls. The only color present are the Christmas ferns, the red plates and cutlery on the set dining table and the avocado green display boards at the head of that set table.